And I needed to be. 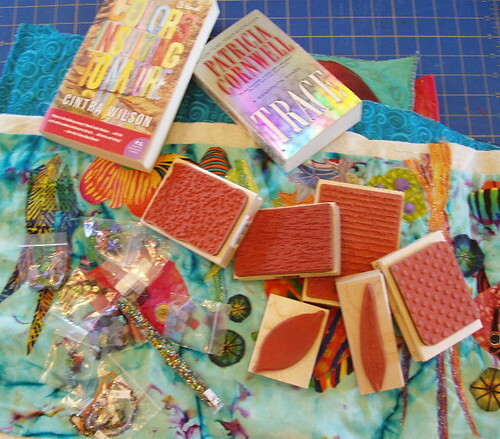 I had to get the quilting done on Five Fancy Fish Frolic which I am doing for the Marin quilt show challenge – Fun With Five. I want to take it on vacation and get the beading done. I am on steroids because Maggie, our JR, gave me a going away gift of Poison Oak. Steve has a little patch on his wrist. I woke up with a full blown oozing rash on the right side of my face, neck and ear. I was able to get in to see Felicity, my doc. (Love her and I just found out today that she and I are both grads of the Cornell Univ. College of Human Ecology (only 20 years apart!!) She just went back for her 25th reunion and I skipped my 45th. I’m holding out for 50!) Back to Poison Oak – the park next to us is filled with it. It is hard to keep Maggie from getting in to it. Then when she gives you some love right after she has been out there, it can be a disaster. Anyway, I finished the quilting and added some embellishments. Now I can have fun with the beading. I have starfish beads, fish beads and other lovely things. I added some fun and frilly yarns to make the underwater plants have more texture and movement. Tomorrow afternoon we will take Maggie to sleep away camp and head to San Francisco to have dinner with Mark. Then on to a motel by the airport. We will stay overnight and take a shuttle to the airport really early in the morning, leaving our car in the care of the motel. Steve is flying to Baltimore and will spend Friday night with his brother in Annapolis. I am flying to Syracuse and will spend the night with my sister Carole and then drive to Rehobeth Beach, Delaware with them. The reason for this is that I am coming back up to New York to spend a few more days going to a family reunion and visiting some friends that I haven’t seen in awhile. Steve is coming back to California after the week at the beach. We are really looking forward to this week. Steve loves spending time with my two b-i-l’s. They have organized a deep sea fishing trip for one day. My quilting sister, Judy, and I are planning on taking some field trips where we will surely get in to a spending frenzy!! One trip we will take for sure is a boat trip to Cape May, New Jersey. There will be my two sisters, Judy and Carole, and their husbands, Carole’s three daughters and son-i-l (a Brit who is loads of fun), Judy’s daughter, who is physician’s assistant and her husband, and one of her son’s and his wife and two little girls. We will do pizza one night, eat out one night and each get a night to cook. We are all on our own for lunches and breakfast. So I think it will be a fun week. Another great thing is that we all love to do jigsaw puzzles and play board games. Can you tell that I am looking forward to this!! It is the family reunion the next week that may not be so much fun. So tata. Don’t have too much fun in cyberspace without me! I may get a chance to blog when I am at my sister’s house. 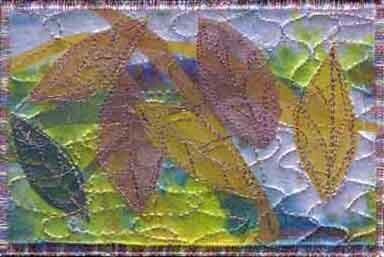 First, I unveiled the ripples and reflections quilt, renamed, Mallory Brook: Ripples and Reflections. I had to dig back into my old brain to figure out what I was connecting with and I realized that it was the brook on our farm where we spent many long summer days. I found a map of the area from way back when and found that it’s name is Mallory Brook. As you can see, I did some major surface design, stamping with inks and fusing some ephemera. Then, I added the leaves cut from the gorgeous dye painted silk. I wanted the leaves to look as if they are floating and I think I achieved that. 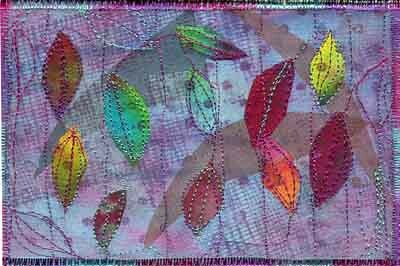 Then I did more surface design with gold textile paint to give the shimmery look of sunlight through the leaves. It was well received by the group. next time, I would think of doing the surface design before I did the quilting, but it does add another ripply dimension, I think. Here is a closeup which is probably closer to the true colors. Here is a work in progress by Diane. It is for her daughter who lives in Alaska. She painted the fish and the fabric for the waves. Here is Diane’s Butterfly quilt which was part of our challenge. She did not get hers done in time to enter at Paducah (Louisville). My butterfly is the third in on the second row. She did a beautiful job of quilting this. 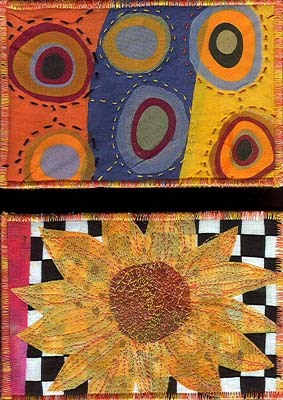 Look at the wonderful colors and fabrics Nancy used in this piece that she started at a class at Asilomar. 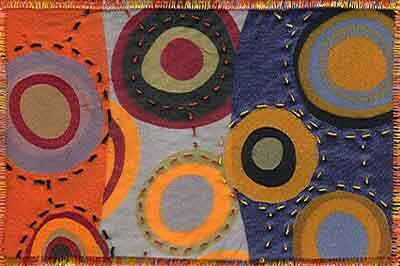 Janet’s Japanese Moons was recently quilted by April Sproule who does lovely longarm quilting for art quilts. This will be finished with an indigo binding. Here is an incredible work by Cathy Z. She does the most meticulous planning and piecing of quilts. Just blows my mind!! This has taken her about 6 months. Here are closeups. There is couching of threads in circles and beading. I wanted to post this last night, but our dsl line went dead right in the middle of updating the SDA website. It didn’t come back until really late and I needed to get to bed so that I could get up and get to work at the office today. During church, Rose, our Rector’s wife, sang two solos. One was Duke Ellington’s, Come Sunday – Ooooh! I cried, of course!! Teluvia was in church and she and her family are moving back to Sonoma County. Her husband works for Whole Foods and he was transferred to Sarasota, FL. She and the kids were not happy there. She said she could not find a tribe like the one she has at Incarnation!! Her husband quit his job, they sold their house and came back here on blind faith. Whole Foods has come through big time and put him in their management training program. I love a company that understands that family is important. I went shopping in the afternoon and scored the Carol King Living Room Tour on sale at Borders. Two books to read at the beach next week: Colors Insulting to Nature by Cintra Wilson and Trace by Patricia Cornwell. I am a Dr. Kay Scarpetta junky. If I was starting college tomorrow, I would want to be a forensics anthropologist!! At Michael’s, I found these amazing stamps in the photo below. At Legendary Beads, I found some great baubles to embellish the Five Fancy Fish Frolic quilt while I am on vacation. I must get the machine quilting finished this week. Steve and I enjoyed a great supper of Caesar salad with grilled shrimp on the patio. Of course then the dsl went down and it was downhill from then on. Tomorrow is Pointless Sisters. Debra is coming. There will be photos!! It is Saturday afternoon and I am having a very nice day!! The house and studio are clean. The fridge is full of yummy leftovers and I’m playing in the studio. Gabrielle wondered why I would consider feeding 20 people. My theory is if you’re gonna cook, you might as well cook big!! It is no more work than cooking for four. Last night we celebrated the tenure of our Realtor and good friend Dean Mitchell as the chairman of the board of The Living Room, a daytime shelter and resource for homeless and at risk women and children. Steve is Treasurer of the board. It was a beautiful evening and we set up tables on the patio. I served grilled tri-tip, BBQ chicken (purchased freshly cooked from my favorite market), a broccoli/cheese/egg dish for the vegetarians, wonderful bread, Caesar salad, rosemary roasted potatoes (purple, red and Yukon gold – so pretty). Appetizers, bean salad and desserts were provided by others. Everyone was gone and we had done as much clean-up as we wanted by 9 pm. So I came up here to watch the movie – Enduring Love – and fused some post cards and did some hand stitching. Pam had this admonition on her blog which was from the brother of an artist friend whose life was ended prematurely – "Take whatever we have and what little time we have and create." Then there was Mrs. Mel telling us all is right with the world because she was finally back in the studio making art!! These postings made me reflect back on my week of a quilt a day and how happy I had been. Every night at dinner, I would say to Steve. " I have to go finish a quilt and I am so happy!" Update: My cards sold out in about an hour! The next two are being mailed out by me. Dot.Calm 3 is going to someone special and the sunflower is going to my sister-in-law who is undergoing chemotherapy for a tumor in the uterus. So, you can see why I am happy! Been making little fiber gems and you know I am crazy for the fiber!! the world has gone to the dogs! !